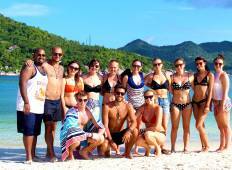 Find the right tour for you through Koh Phangan. We've got 86 tours going to Koh Phangan, starting from just 3 days in length, and the longest tour is 105 days. The most popular month to go is August, which has the most number of tour departures. "Lisa was fantastic! She was super knowledgable and was able to answer all of our..."
"Trip was nothing like I expected at all, met so many amazing people who I wouldn't..."
"The tour was fantastic. It had all the main things included for a trip that had a..."
"Tadd and Amy are the best tour leaders ever! They both show excellent leadership..."
"Lauren was an amazing guide for our week long tour of the Thai islands! She really..."